The Concours of Elegance – one of the world’s finest classic car events – has revealed its unique Charles Avalon-designed artwork, ahead of this year’s event at Windsor Castle from 2-4 September. Avalon, the house artist of Pullman Editions, has designed four of the five Concours of Elegance posters since the event began in 2012. 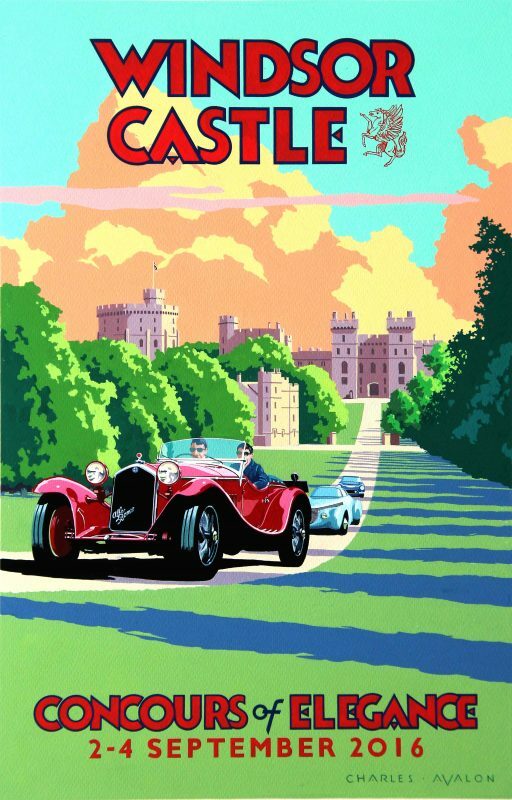 Capturing both the unique location and world-famous calibre of the cars, the art deco poster depicts an Alfa Romeo 8C 2300 Zagato Spyder leading a one-off Hispano Suiza Dubonnet Xenia and a Ferrari 250 GT Berlinetta Competizione on Windsor Castle’s Long Walk. These three models are just a small selection of the sixty incredible cars that will line-up inside Windsor Castle’s glorious Quadrangle from Friday 2nd September to Sunday 4th September. Other highlights include the only factory-built Ferrari Testarossa Spider in existence and 1937 Bugatti Type 57S Corsica Cabriolet. In addition to those sixty cars, Concours of Elegance will welcome more than 1000 rare and exotic cars to Windsor Castle, as the nation’s best car clubs including those of Ferrari, Aston Martin, Rolls-Royce, Jaguar and Bentley, line-up on the Long Walk. The event will also be celebrating Her Majesty The Queen’s 90th birthday with a selection of the original cars from Britain’s first Grand Prix, held 90 years ago this year. A further feature will celebrate British motoring icons from each decade of Her Majesty’s life. Available in strictly limited editions of 280, Pullman Editions’ posters are printed using traditional techniques on the finest quality 100% cotton fine art paper. The posters measure 97 x 65 cms (38 x 26 inches), are each priced at £395 each and available from www.pullmaneditions.com. Concours of Elegance takes place between 2-4 September and has partnered with a series of exclusive brands for the event, including AIG, Autoglym, Bentley, Ferrari, Jaguar Land Rover, Octane, RM Sotheby’s and the Royal Automobile Club. Tickets are available now from concoursofelegance.co.uk, with an adult ticket costing £40, and discounts for children. A variety of hospitality packages are also available. One of the primary aims of Concours of Elegance is to raise money for charity, and this year’s event will be generating funds for The Queen’s Choral Foundation, The Household Cavalry Foundation and Springfield Youth Club Hackney. So far, Concours of Elegance has raised more than £800,000 for its charities.